We are pleased to announce that our 2016 Crab Raffle was a success! 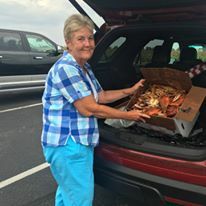 Ms. Faye Caldwell picked up her bushel of crabs and "fixings" on September 10, 2016 after her name was drawn on September 7th. Thank you to all that participated in this fundraiser and for your support of our Girls Group Home. Your generosity raised over $700.00 and the money raised will be used to purchase new school shoes for each of our girls in the program. We would also like to thank Matt and Taylor Bowman for donating the beautiful crabs pictured above.